Any animal can be milled! That is a truth that not everyone realizes. Sugar Gliders, Rats, Chinchillas, rabbits, foxes, Ferrets and kittens. Any animal that you see in a pet store has (more than likely) been milled. Thankfully, there has been some (not enough) media attention surrounding puppy mills. Most everyone has at least heard the term or seen a picture and realizes that it isn’t a good thing. But sadly, any animal that is sold in pet stores is usually milled. Just think about it- pet stores are always able to have more than enough of the animals listed to sell to anyone that walks in their door. And why is that? Since there is a demand, there will be an industry. There will always be “farmers” that make sure there are more than enough rats, hamsters and chinchillas to keep the cages in the pet stores full. But because no one is speaking out against these types of mills, breeders are able to switch which species they are breeding rather easily. 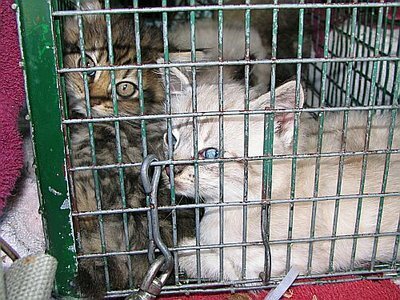 Many former puppy mill breeders have switched, and now breed a multitude of cats to public (and private) organizations. Much like the puppy mill industry, the breeder has absolutely no concern for the health of the animals, the conditions they live in, or the fate of the animals leaving the property. Kitty mills are just another example of humanity’s “supreme reign” over the animal kingdom. We have the power to torture for profit, so we do. Most people don’t even think that kitty mills are that prevalent in this day and age because of the high number of cats in shelters. However, it is a huge problem. According to the Humane Society of the United States, most cats are adopted “casually”. About 48% of human owned cats are taken in as strays, or found by someone who gives the kitten or cat to a friend, or is adopted directly from a rescue league. A much smaller percentage, 14%, adopts their cats from shelters, especially kill shelters. The remaining percentage goes directly to either breeders or pet stores. However, with all this kitty purchasing going on, 71% of all cats or kittens that find themselves in the unfortunate position of being in a shelter are euthanized before forever homes can be found. Only one out of every five kittens and cats are destined to live in one home for their lifetime. Most cats find themselves abandoned or left on the shelter doorstep when they are either too much responsibility or lose their cute little kitten appeal. But it’s not just dogs and cats…. Again, every animal can (and is) milled. There are thousands of small animal mills in the United States, with millions of rats, mice, chinchillas and rabbits who are suffering for their short lives. These pets are not only sold to pet stores, but they are sold to testing facilities and bred at colleges for “scientific purposes”. Where do we draw the line? Commercial pet dealers who breed or sell most warm-blooded animals to pet stores are required to be licensed and inspected by the U.S. Department of Agriculture. But The HSUS’ review of USDA inspection reports reveals that many of these breeders are guilty of repeated violations of the federal Animal Welfare Act for crowded and dirty conditions. But what can we do? As a group that is actively fighting puppy mills, we have a hard enough time getting people to care about dogs living their entire lives in cages… Letalone getting people to care about rats. But education is so important. Getting the word out about ALL types of animal mills and raising awareness about the conditions in which these beating hearts are forced to live. So, we already know that pet overpopulation is a big problem in this country, and many other countries. But are there really small animals in shelters waiting to be adopted? YES! There are! Please check petfinder.com or adoptapet.com . Any animal that can be purchased, is usually dumped on local shelters, rescues or craigslist. So please, the next time you are looking to add ANY pet to your family, consider adoption first! That was quite an eye-opener about kitty mills – thank you for sending it. I looked through all the Iowa breeders (for each breed). They aren’t all necessarily “mills”, are they? I’m guessing you are saying there is no good way to differentiate between a mill, and a good, caring breeder, unless you actually visit their facility? Ask questions, observe environment, etc.? Or maybe hear about them by word-of-mouth . . .
Why, oh why, would ANYONE feel they need to purchase a designer or pure-breed cat? Or puppy? Or even a mutt/”Designer Dog?” Millions and millions of amazing cats, dogs, kittens and puppies are destroyed in shelters annually. And it’s because the pet trade industry has pushed their Kool-aid onto any consumer gullible enough to drink it. If you believe that shelter and rescue pets are somehow inferior to the puppies and kittens produced in puppy and kitten mills, then you, too, have already had a sip…and the cycle of misery continues. There are two kinds of people who own cats: Pet people and Animal People (meaning animal advocates/rescuers). Pet people own animals for their own pleasure, Animal people own animals to provide better lives for them. People who get animals from breeders (ALL breeders, good or bad) see animals as novelties for their amusement. Anyone who gets a cat from a breeder, kitty-mill or not, does NOT have the feline population in their best interest. For every kitten in demand, a perfectly lovely adult cat dies in a shelter and people who support breeders are largely responsible for this. I’ve been writing a series on puppy mills on my blog….if that isn’t discouraging enough, it hadn’t even occurred to me yet to think about the same for other animals. Ugh. If I wanted another cat, a pet store is the last place I’d go. Last time I visited my local shelter, the number of cats there was heartbreaking. But unfortunately, not everyone thinks like we do. So great job on getting the word out about this, and I will share your Facebook post as well. That’s what I’ve been preaching on my blog….that getting the word out is what we need to do. We can’t do it enough. That is the only way we are ever going to put these breeders out of business, by ending the demand for what they are doing. Thank you. You said it Kristin, well said! So awful! People need to be aware! Have the power to change like with Puppy Mills.